Wealth warning: This post should at best be taken with a pinch of salt and at worst should be likened to crystal ball gazing. 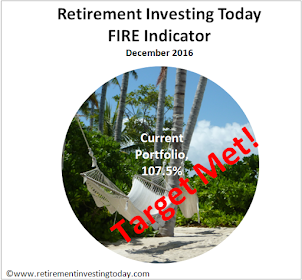 I’m posting it because this blog is about retirement and particularly early retirement so it is particularly relevant. If in retirement, including early retirement, we decide to use a strategy that generates an income by drawing down on our wealth, as opposed to say buying an annuity for example, then there are 4 key decisions that we need to make. They are what withdrawal rate are we going to make (which could be fixed, variable or fixed with an annual inflationary increase to name but three), how much risk (where risk is the likelihood of wealth depletion) are we going to take, what does our asset allocation look like (the equity : bonds ratio) and how many years do we want our wealth to last (the duration). The aim is to settle on a combination that suits our needs while ensuring we don’t run out of wealth before we run out of life. The one decision that is unfortunately out of our control is the sequence of returns that Mr Market is about to provide. The 4% Rule is but one combination of these variables. 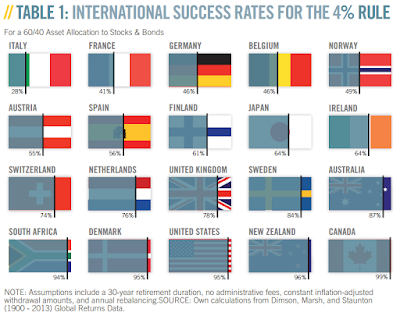 Based on historical returns it states that if you settle on a 50% US stocks : 50% US bonds allocation, accept risk that will historically fail 4% of the time and a 30 year time period then you can take a maximum withdrawal rate of 4% of your wealth on day 0 and then increase this by inflation annually. 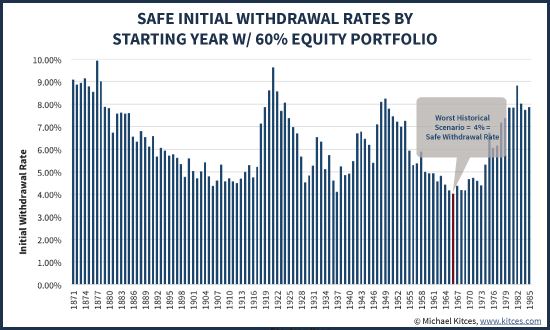 This post, which for some reason received very little interest from readers but which was highlighted by somebody I respect very much, then shows the historic maximum withdrawal rate available to us for a given asset allocation, risk and duration. The problem with all of this work is that if history repeats and we are reasonably prudent in selection a withdrawal rate it more than likely results in us leaving wealth on the table (or more inheritance than planned) at the end of the duration. Historically that is also a very large sum in sum instances. Take the 4% Rule for example. Historically it fails 4% of the time which means it succeeds 96% of the time. This is where sequence of returns comes in. If we could predict (or even get somewhere in the ball park) our sequence of returns then we could more than likely take a higher withdrawal rate which could either give us a higher standard of living (which is of course very different to quality of life) or enable us to retire earlier. This work by Michael Kitces, for example, shows that for a 60% US stocks : 40% US bonds asset allocation and a 30 year duration the safe withdrawal rate is not unexpectedly 4%. However what it also shows is that if we retired in the right year and knew the sequence of returns that would befall us in advance we could increase that 4% to as much as 10%. That is a big difference! To put that in perspective somebody wanting earnings of £25,000 per annum would need to save and invest their way to £625,000 for the 4% but only £250,000 for the 10%. I know I expended a lot of blood, sweat and tears for that difference of £375,000 on the way to FIRE. Before we move on it is important to note that these two variables only explain 55% of the fluctuations in historical withdrawal rates thus at least one of many reasons for my wealth warning at the top of this post. So what’s the predicted withdrawal rate today I hear you ask. Today the PE10 is 27.0 and the 10-year Treasury is 1.6%. Plugging those numbers into the formula and we end up with a predicted withdrawal rate of 4.1%. Of course it could end up more or less, we won’t know that for another 30 years, but what I do find sobering is that it is not far off the 4% Rule which only had a 4% failure rate. Does that imply we are yet again walking into a very poor sequence of returns? This post would not be complete without pointing out a 5th key decision. That is the country where we spend and the country where our assets are held. I’ve posted about this before but the graphic below shows it pretty clearly. The 4% rule was derived from historic US stock and bond sequence of returns. 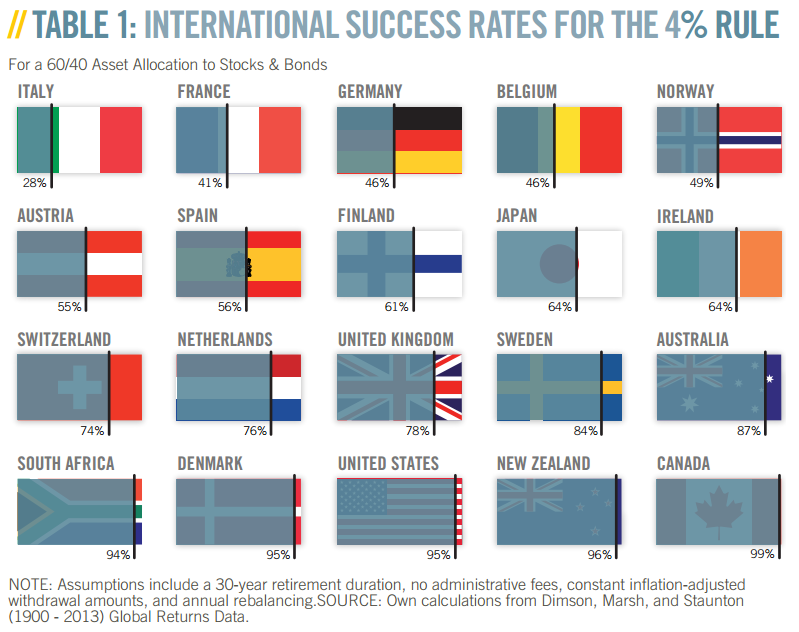 Head to most other countries and success rates for the 4% rule are worse with the UK failing 22% historically. Full disclosure: I’m still happy with my plan to start FIRE with a withdrawal rate of 2.5% plus investment expenses. Thanks. I'm approaching an age where withdrawal strategy discussions are becoming increasingly interesting. Shouldn't the UK failure rate in the last section be 22% rather than 32%? Slightly less awful. Thanks for pointing out the typo Steve. Duly corrected. Too early on a Saturday for maths. Do you have a view yet on what your withdrawal strategy might look like? I’m not yet at a stage where I’d call it a “strategy”. I’ve spent the last 5 years moving from “who needs savings?” to “we’d better start saving before retirement!”. This seems a common progression for the self-employed. I’ve now got maybe 5 years before the accumulation switches to decumulation. Two recurring themes of many mainstream retirement planning articles seem inappropriate for my circumstances. 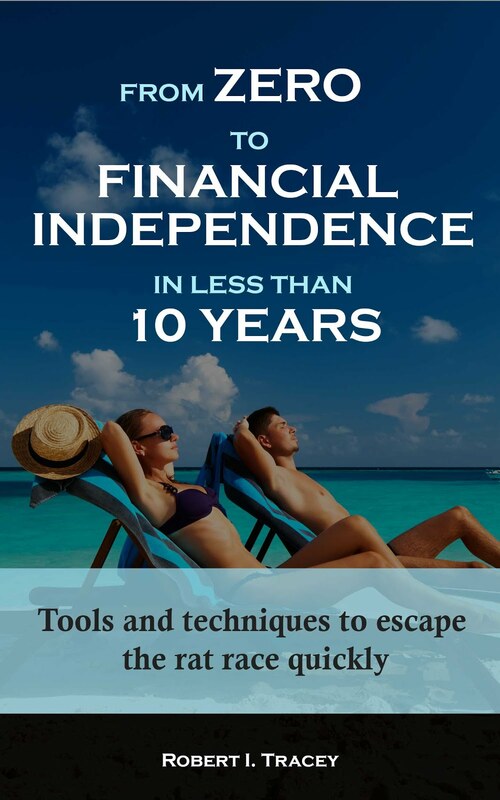 The nature of my work means there probably won’t be a hard cut off, and I’ve spent 25 years handling wild swings in income, so a regular, predictable, income stream in retirement isn’t a huge priority. Maintaining cashflow to cover essential costs has been an issue for 25 years, so won’t be anything new in retirement. I appreciate websites (like your own) that address the underlying factors & nuances, rather than suggest a “one size fits all” approach. As a late starter, and not a natural saver, I’ve focused on income. Planning to live on a bit less than the natural yield feels simpler than drawing down on growth assets. On the other hand, it also means you’re drawn to yield, and prone to follow the herd. Selling assets to provide income feels hard, and I suspect much of my next 5 years will be spent pondering this issue. Many thanks for the thoughts Steve. Like you I'm planning to live off the natural yield of my portfolio. Right now my portfolio is spinning off a yield of 2.9% which with my WR of 2.5% will enable some reinvestment in the good times and will give some contingency in the bad. I also would find it hard to sell down capital given the energy I've had to expend to build it and so I consciously built a portfolio with an appropriate yield. (i) "these two variables only explain 55% of the fluctuations in historical withdrawal rates": beware, that's "explain" in the statistical sense, not in the sense of everyday English. "Does that imply we are yet again walking into a very poor sequence of returns?" The Swiss 50 year has gone negative? With the increase in the money supply and so much debt in the system, household, leverage to buy shares, pension deficits, etc. return of capital is more the theme than return on capital. Where do you stand on self sufficiency? You have posted pictures of villas that imply the purchase of all food essentials. What about the insurance of some land to grow things and possible extra income? Could you not approach Mr Market direct, a.k.a. Life Assurance companies and request a quotation for an Annuity for your circumstances? I'm sure they wouldn't use the same formula, but it would be an interesting comparison - after all, these guys are reliant on getting these sums right to ensure they generate a profit over the long term. Annuity rates are much lower than self-invested returns because the life assurance companies price the risk they are taking on highly as well as needing to cover admin costs and profit. I suspect if you approach them at 43 you'd be so far outside their tables they'd either refuse to quote or apply a crippling premium, as they wouldn't want the business.